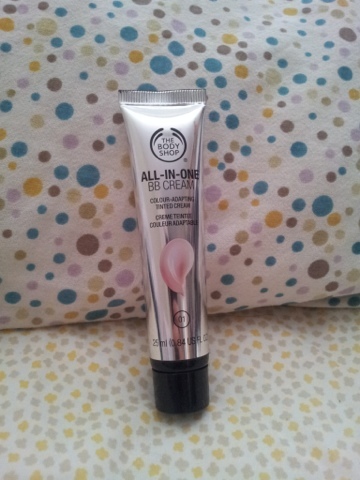 This is a quick review on the All-in-one BB Cream from The Body Shop! The key figure of this BB cream is that its "Colour-Adapting", meaning the cream itself can change its shade to fit your skin colour. How it works is it contains pigment micro beads and when you start rubbing the cream into your skin the beads would burst and changing the colour. It doesn't actually "adapt" to your skin colour but its actually quiet cool to see the colour changing as you rub! The coverage is fairly light in comparison to other BB creams such as Super + BB from Skin79. It would be great for those of you who doesn't like to put on that much make up yet have a bit of coverage. I am still recovering from my acne scars so just with this BB cream, it definitely didn't cover it perfectly (but there's always concealer as the backup plan!). One thing I feel it needs improvement on is variations of shades that is available. Even though I got the lightest shades out of the three, yet the shade is still too dark on me :( ! However, I really like how moisturize this BB cream is and doesn't make your face look super oily! With BB creams, your face can never look TOO CAKEY! Overall, I would give this BB cream a 8/10.